Like overstretched American homeowners, governments and companies across the globe are groaning under the weight of debts that, some fear, might never be fully paid back. via After Dubai, Wondering Where the Next Debt Bombs Lurk – NYTimes.com. via Avoiding another Dubai – INSIDE JoongAng Daily. 1) Back in February of 2008, Chris Anderson wrote the original cover story for Wired Magazine, title “Free! Why $0.00 Is the Future of Business.” Recently he has expanded this into an entire book. I have felt for the past year or so, that Chris’ first article is quintessential reading for the entrepreneurial set. More on why later. 2) In the July 6, 2009 edition of the New Yorker, one of my favorite authors, Malcolm Gladwell, took issue with Chris’s book in an article titled “PRICED TO SELL“. In this article, Malcolm does a good job of disputing some of the core pillars of Anderson’s thesis. Basically, there is always a cost to delivery, even if its really low on a marginal basis, and in volume it can get quite expensive on the cost side. He also, appropriately highlights that “Free” is not a panacea of a business model. It doesn’t always work. 3) Mark Cuban then chimed in with not one but four posts: “Free vs Freely Distributed,” “When You Succeed with Free, You are Going to Die By Free,” “Google Is Learning the Reality of Free,” and “A Quick Ditty on Free.” Mark, like Malcolm highlights many of the dark elements of the Free model. Namely, it is risky, it can be costly, and that the “freemium upgrade model” may be create a lead that is temporary. Here is where I come down on all of this. First and foremost, Free is a disruptive force. This does not mean that if you deploy a free business model you will be successful. In many (perhaps even most) cases you will not. However, if a disruptive competitor can offer a product or service similar to yours for “free,” and if they can make enough money to keep the lights on, then you likely have a problem. To me this is the essence of Free and why no one can ignore it. It’s less about offense and more about defense. If Anderson’s thesis holds, it casts doubt on the future of online advertising and other revenue sources on the Web. Anderson laments that people seem to have misunderstood his thesis, because he had no intention of casting a pall over the future of the Internet. As Anderson points out, a deeper examination of free, suggests that giving something away can be a transition to a viable monetization strategy if it leads to the sale of something else. Google gives away search as a service to the Web, but it leads to revenues from advertisers who value click-throughs. The Wall Street Journal gives away the lead to its articles, in the hopes that people will pay to read more. The founders of social networks were amongst the first to recognize potential value of social and conversational capital. The more friends you have on Facebook, MySpace or LinkedIn, the more influential you seem to be. Influence can be translated into other things, but only if there is a vehicle for monetization. Social dollars are a mechanism to translate the value of free into something of tangible value. 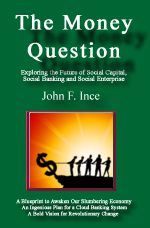 Social banks will create social dollars using a fractional reserve ratio, just like commercial banks create dollars when they make loans by leveraging the value of their deposits of dollars. Because retailers and others attach a value to social dollars in their product discounts, social dollars have value to users. If this sounds like hocus pocus, consider that it’s the same hocus pocus that bankers use when they create money out of thin air by making accounting entries on their balance sheet in extending credit. Bankers don’t have the money they lend out to borrowers, but borrowers still value what they have received in their loan. All it takes for the system to work is trust in the system, and an infrastructure to manage the transactions in social dollars. The development of such an infrastructure is inevitable, if the Web is to grow as a viable platform for business development. Why? Today in the Web-based social networking and social media contexts there is untold value in social and conversational capital. The initiator of a Web-based conversation gets a return on their investment with increased exposure and stature. Marketers try to capitalize on this exposure, by enticing participants in the conversation to buy products. In that sense, conversation and the interest it generates is a currency. It’s like the loans bankers make in dollars, and the return is like interest that bankers charge on their loans. Yet there is no mechanism to attach an economic value to this “social capital.” Hence, it’s mostly free. With social dollars in circulation, suddenly there is a way to monetize the value of “free.” In other words, the Web is evolving as we speak. There is too much capital and creativity now invested, for the darker side of Chris Anderson’s hypothesis to hold. The need for mechanisms to monetize the value of what is progressing toward free will propel the development of a Web based social currency like social dollars and financial intermediaries like social banks to facilitate its flow.